Released in the US as "Pirate Radio" after heavy editing, this is the original uncut British release. Richard Curtis turned his talents to telling the story of 1960s pirate radio with The Boat That Rocked. And while the film may not have scaled either the commercial or critical heights of some of his earlier work, there are still plenty of reasons to commend the film. Chief among them is the excellent cast. 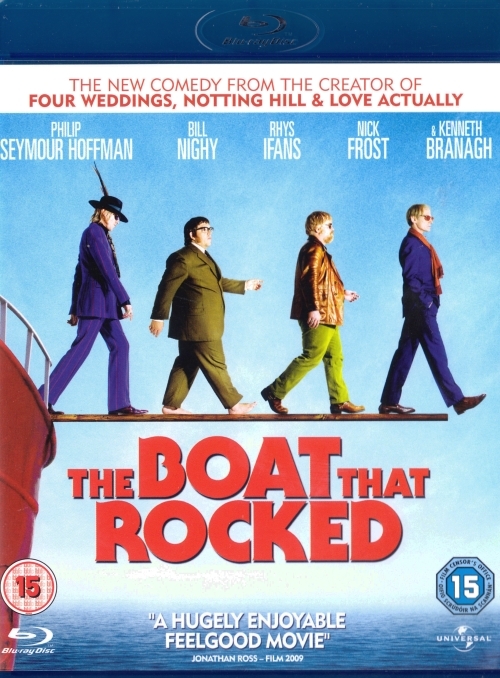 The Boat That Rocked brings together a welcome collection of British talent, including Bill Nighy, Kenneth Branagh, Rhys Ifans, Nick Frost and Gemma Arterton, and then they're joined by Philip Seymour Hoffman. Between them, they effectively recall the Radio Caroline story, as a pirate radio station is set up on a North Sea cruising yacht, broadcasting to England. Said broadcasts become wildly popular, making celebrities out of some of those concerned. Yet naturally enough, the authorities, led by Branagh's Sir Alistair Dormandy, aren't best pleased. Curtis then laces The Boat That Rocked with plenty of comedy, and a killer soundtrack. But he loses his focus when editing the film down, as it's a movie that, try as it might, still manages to outstay its welcome by a good 20 minutes. It doesn't help that he's simply trying to cram too much in here, and contrasted with the tight screenplays of some of his earlier films (take the script of Notting Hill as an example), it's curious that he chooses to do so. Yet quibbles aside, The Boat That Rocked is still a fine comedy, with a real love for its subject matter. It arguably works best in the home, too, over the big screen, and with many laugh-out-loud moments, and some memorable characters, it's ultimately hard to resist the film's many charms.